These days, when Detective Alex Cross gets called to a murder scene late on a Sunday night, he knows it’s going to be bad. This one is beyond bad. An entire family, brutally butchered in what looks like a home invasion. Getting a look at the face of the wife/mother sends Alex into shock. It’s Ellie Randall, his first love from college. Not believing this is just random violence, Alex begins working the case with a vengeance. His search takes him, over the strenuous objections of his family, to Nigeria. Working from clues he found in an unfinished manuscript for Ellie’s latest book, Alex is on the trail of The Tiger, a mercenary who uses gangs of ruthless boys to commit his crimes. The Tiger is a native and Alex is a stranger in Africa, where everyone clearly knows he’s American. He gets some help from an elusive CIA operative, but he’s mostly on his own, thousands of miles from home. When a new Alex Cross book comes out, I’m happy. It’s not unusual for me to have to suspend disbelief a bit, but the author is so good at this series that it’s usually not a problem. This time around, it’s a little different. It’s hard to believe that a man who is a psychologist, a former FBI agent, and a longtime detective would be so blind to cultural differences. He literally gets off the plane in Nigeria and announces that he’s an American cop, looking for a murderer. What follows is horrible, but, in retrospect, not really surprising. It’s no spoiler to tell you that Americans are not beloved the world over, as a rule. Alex moves from Nigeria to Sierra Leone and back, on the trail of The Tiger. Along the way, he comes face to face with the appalling conditions under which so many people live and, most often, struggle simply to survive another day. It’s a story that desperately needs to be told to as wide an audience as possible. Alex endures repeated attacks, beatings, blows to the head, and worse in his search for justice. It’s nearly three-quarters of the way through the novel before someone finally tells him that he’s got absolutely no authority in Africa. It seems that he should have known that. To be fair, though, given his character, he probably would have followed the same path in any case. 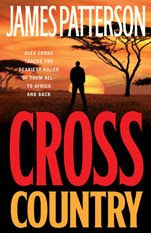 All of that aside, CROSS COUNTRY (follow-up to CROSS and DOUBLE CROSS in the continuing story of Alex Cross and his family) is boilerplate Patterson. The short chapters keep you flipping pages, but it’s the action and plot that keep you reading. It’s honestly difficult to find a place to stop. So I didn’t. Read in one sitting, this is a lot of action, a lot of bloody violence, and a lot of anguish. The story of the native peoples of Africa, who are being systematically killed and exploited by their own (and others) for fun and profit, is one that deserves attention and action. I feel more than a bit guilty being so entertained when there’s so much genuine suffering going on, with no end in sight.